The Lost Words is a book by Robert Macfarlane and Jackie Morris that summons the magic of nature to help children find, love and protect the natural world. First there was the finding that British primary school children were more at ease naming their favourite Pokémon character than they were at naming a hare, a deer or an oak tree. Then there were the revisions to a new edition of the Oxford Junior Dictionary: out went everyday nature words like acorn, bluebell and kingfisher, no longer used enough by children to merit inclusion; in came attachment, broadband, voice-mail, reflecting today’s tech-savvy child who is more at home on the internet than they are in the woods. Fascinated and concerned by these changes, Dr Robert Macfarlane began to wonder about the relationship between childhood and the living world. After Macfarlane read the ‘Pokémon paper’ (a study published in Science in 2002 by Professor Andrew Balmford from Cambridge’s Department of Zoology), he started to gather other evidence of a loss of ‘nature-literacy’. A National Trust survey, for instance, showed that half of children couldn’t tell the difference between a wasp and a bee, yet almost all could name a Dalek; and a three-year RSPB research project found only one in five children in Britain are ‘positively connected to nature’. A report by the National Trust on Natural Childhood in 2012 set out compelling evidence that a decline in childhood wellbeing and mental health and an increase in obesity rates are just some of the costs of a generational decline in having freedom outdoors. And so, two years ago, Macfarlane and artist illustrator Jackie Morris embarked on The Lost Words, a ‘spell book’ they hoped might help close the gap between childhood and nature in Britain. The result is both enchanting and hopeful. 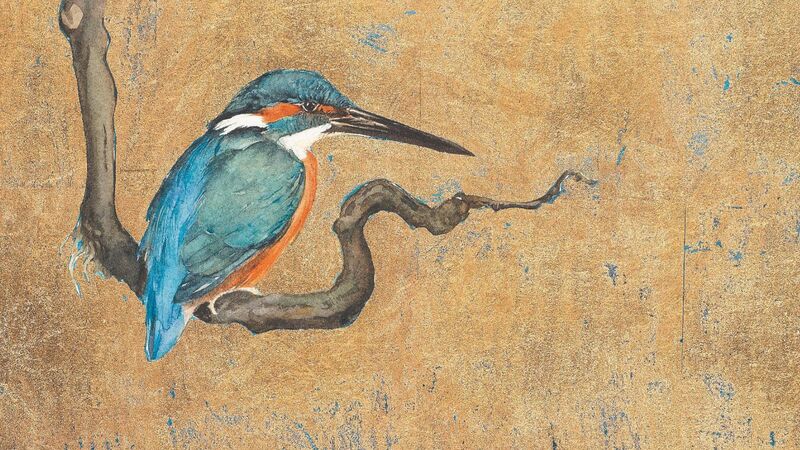 For each name, Morris would first paint its ‘absence’ –the suckers of an ivy trail without the ivy, the ripple of water reflecting the blue-green of a missing kingfisher, the puddling droplets shaken from an omitted otter. Readers then turn the page to find ‘spells’ – the first letter of each line spelling out the missing name, and the words and images summoning the character of each creature. The otter is a slippery shape-shifting underwater thunderbolter; the marching bramble is snarling cars and stealing through keyholes. It’s a book to thrill the lover of words, rich with the influences of Gerard Manley Hopkins, Dorothy Wordsworth and the metaphorical nature of Old English kennings – the adder has sine-wave swerves, ivy scales are like sky-wire, the kingfisher is colour-giver, fire-bringer, flame-flicker, river’s quiver. The relationship between naming, knowing and nature has long interested Macfarlane. The Lost Words grew out of research for his book Landmarks (2015), which examined the work of a dozen British and American writers of place, and gathered and organised over 2,000 terms for nature, landscape, creatures and weather from more than 30 languages, dialects and sub-dialects of Britain and Ireland. The book ended with a chapter called ‘Childish’, about the relationship of childhood and nature. A year after publication, the book has already won two literary prizes and been translated into several languages. It’s been described by The Guardian as “a cultural phenomenon” and by the naturalist and presenter Chris Packham as a“revolution”. The book is being adapted for film, a choral work, a folk album, classical concerts and outdoor theatre; it’s being embroidered in braille and painted on hospital walls. “Certainly, it’s been an odd and exciting thing to be part of,” says Macfarlane. Perhaps the most surprising and moving experience for Macfarlane and Morris has been the crowdfunding initiatives that have sprung up after Jane Beaton, a school bus driver from Stirling, raised £25,000 to give the book to all 2,681 schools in Scotland. In London, The Big Green Bookshop took only four days to raise enough funds to donate a book to the primary schools in the London Borough of Haringey, and the latest campaign by the charity Trees for Cities hopes to raise enough funds to donate a copy to all of the primary schools in Greater London. A proportion of proceeds from each copy of The Lost Words is being given to one such organisation, Action for Conservation. Above all, The Lost Words aims to inspire children to love, benefit from and protect the natural world – “to seek, find and speak” it in the pages of the book and in the universe of their landscapes. Macfarlane writes in the book’s foreword of an‘old, strong magic’, whereby things are never truly lost if they can be conjured back into the mouths and mind’s eyes of children.